If you have an iTunes audio library of music, songs, podcasts, ripped CDs, and other media, you may want to gain direct access to those files at various points in time. 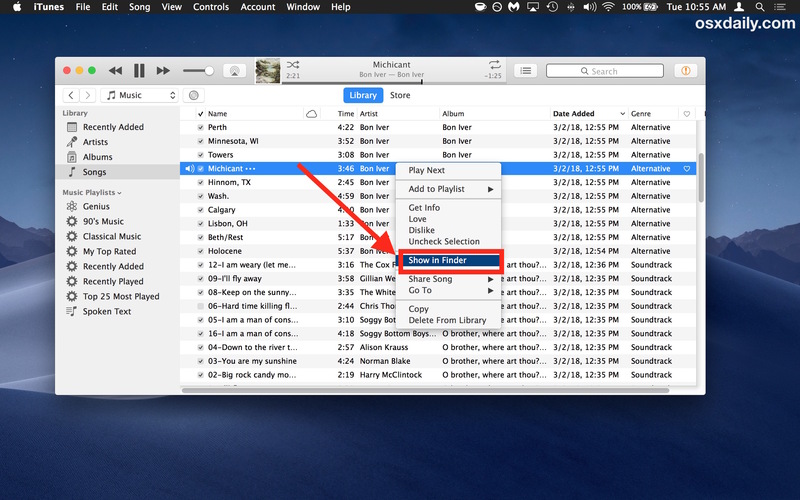 While you can navigate in the file system of Mac OS or Windows to access the location of the iTunes Library, the iTunes app offers a nice and simple shortcut to immediately jump to the actual audio file of any track in your iTunes library. This feature is available in basically every version of iTunes, it’s probably the fastest possible way to get access to the original audio file (and its parent location) from iTunes. Essentially this jumps right to the audio track within the file system, which is almost always the default iTunes Library location. Because of how iTunes defaults to arranging audio files, if the track is part of a music album then you’ll be in a directory with all other songs from that album. You can also navigate to the parent directory to access other albums or tracks from that artist. This is a great trick to use after ripping a CD with iTunes if you want access to the ripped audio files, whether to transfer the files elsewhere, like to a cloud storage platform or to make a backup to an external volume. 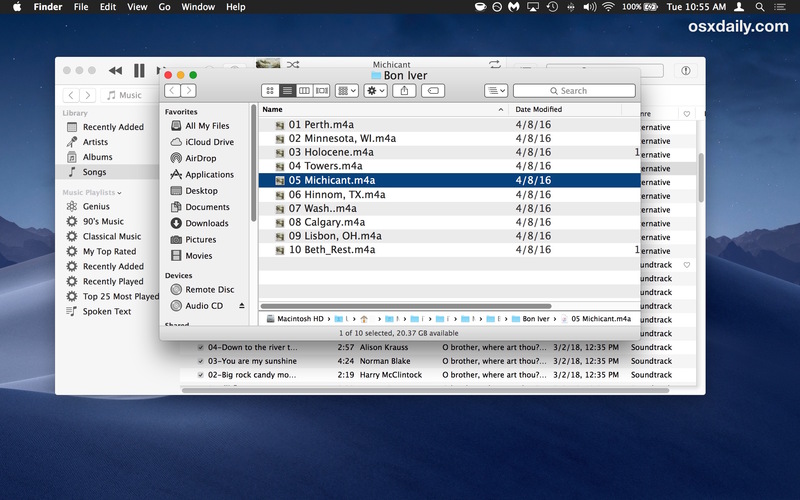 Similar features exist elsewhere on the Mac, for example in the Photos app allowing you quick access to the original Photos file on the Mac directly from the application itself, or finding the original item from an alias in the Finder, or even in iTunes if you’re wanting to quickly track down a ringtone file from the app. Help! I have iPhone 7S and iPad Air running OS 12.1. I can’t access my music on iCloud in iTunes uploaded from my iMac running OSX El Capitan 10.11.6. How can I get my music back? I’m not sure if anyone understands iCloud Music, meanwhile Apple has a totally separate thing called Apple Music which is also confusing. Both are in iTunes, but it’s a mystery to all. iTunes is really most useful to backup an iPhone and play music on the desktop from local files. Personally I use Spotify for cloud music and streaming, it just works. spotify: why pay someone money for music they did not make? Don’t forget the EVEN QUICKER venerable shortcut  ⇧ R that makes exactly the same by 2003!!! Except it can’t be done on modern Macs because they no longer have any  key. so young and so ignorasnt to ignore which key sign replaced the  sing! Your reply is INCREDIBLY condescending. Have some humility my friend, you’ll be a better person as a result. P.S. Ironically, it’s spelt “ignorant”.